Maize (M.M. Goodman, C.W. Stuber). Hexaploid wheat (G.E. Hart). Barley (A.H.D. Brown). Rye and triticale (V. Jaaska). Oats (S. Price, A.L. Kahler). Rice (T. Endo, H. Morisha). Tomato (C.M. Rick). Potato (C.L. Desborough). Peppers (M.J. McLeod et al.). Tobacco (S.J. Sheen). Petunia (H.J.W. Wijsmanj). Alfalfa, luzerne (C.F. Quiros). Soybean (Y.T. Kiang, M.B. Gorman). Sunflowers (A.M. Torres). Cole crops (P. Arus, C.R. Shields). Celery and celeriac (T.J. Orton). Cucurbits (F. Dane). Strawberry (S. Arulseka, R.S. Bringhurst). Fruit trees (A.M. Torres). Eucalyptus (G.F. Moran, J.C. Bell). Conifers (J.B. Mitton). Developments in Plant Genetics and Breeding, 1: Isozymes in Plant Genetics and Breeding, Part B focuses on the advancements in the processes, methodologies, principles, and approaches involved in the study of isozymes, including its role in plant genetics and breeding. The selection first offers information on maize, hexaploid wheat, and barley. Topics include polymorphism, linkage relations, esterases, evolutionary and crop improvement studies, special applications to genetics and breeding, alcohol dehydrogenase, amylase, catalase, and catechol oxidase. The text then examines Secale and triticale, oats, rice, and tomato. The publication takes a look at potato, peppers, and tobacco. Topics include biochemical characterization of isozymes, isozymes in cell and tissue cultures, glutamate dehydrogenase, lactate dehydrogenase and xanthine dehydrogenase, potato as a source of enzymes, and data for esterases in basic gels. The manuscript also tackles conifers, eucalyptus, fruit trees, cucurbits, and cole crops. 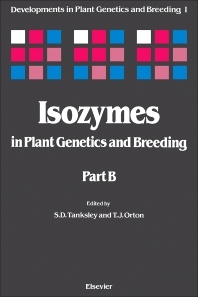 The selection is a valuable reference for researchers interested in the role of isozymes in plant genetics and breeding. Dr. Orton attended Michigan State University, where he earned a Ph.D. in Botany and Genetics. He was then an Assistant Professor and Geneticist at the University of California, Davis where he conducted research on breeding and genetics of cool season vegetables. Subsequently, Dr. Orton was a Group Leader at Agrigenetics Corp. (Boulder, CO) where his focus was on the applications of biotechnology in plant breeding. Later, he was appointed as Senior Director at DNA Plant Technology Corp. (Cinnaminson, NJ) charged with all aspects of product development of fresh pre-cut/packaged vegetables, including plant breeding and applications of biotechnology. He developed new celery and carrot varieties, and was awarded a patent for food processing applications of vegetable varieties. He then joined the faculty of the School of Environmental and Biological Sciences at Rutgers University, where he served as Department Chair and Assistant Director of Rutgers Cooperative Extension before assuming his current position, Professor of Plant Biology in 2004. He is located at the Rutgers Agricultural Research and Extension Center in Bridgeton, NJ. His research and extension program focuses on fresh market and processing tomato genetics and breeding, specialty Capsicum pepper breeding, season extension in asparagus, and new product development in perishable commodities. Dr. Orton has taught undergraduate “Plant Breeding” at both UCDavis and at Rutgers, where he has co-taught for the past 15 years. He has been active in the development and dissemination of scholarship, publishing 48 refereed papers, 14 invited book chapters, 2 co-edited books (on applications of biotechnology in plant breeding), and a large complement of abstracts, non-refereed articles, and conference proceedings. He has been invited to present his research results at 50 scientific meetings and institutional seminars, and garnered $1.8 million to support his programs.